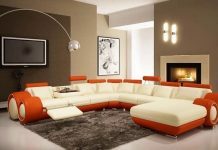 Roohome.com – If you have difficulty in finding a suitable design for your living room, you can take a look these 3 minimalist small living room ideas by brilliant designers below. Each design has a powerful and amazing concept which will inspire you a lot. The designers create their masterpiece by using contemporary decorating ideas in order to make your living room more stylish and fashionable. 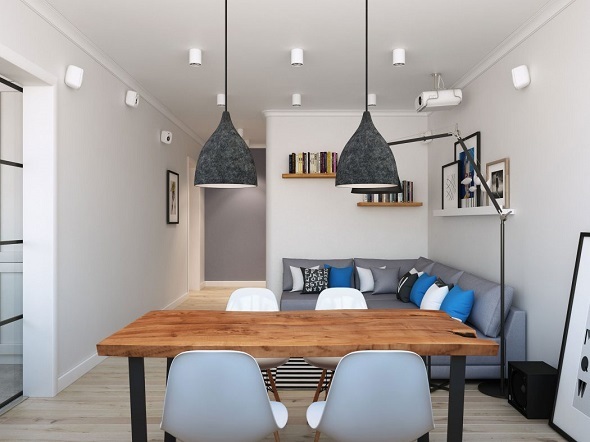 Do not waste your time, grab your chance to apply these small living decorating ideas below! 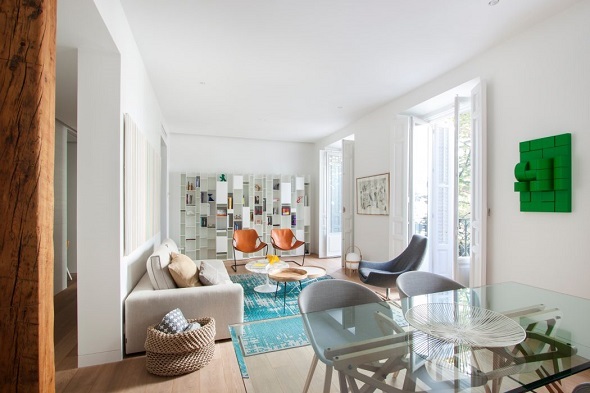 The first design is brought by Dori Interior Design that shows you how to decorate a small living room by applying a simple interior innovation in it. The designer thinks to create an extraordinary concept in this small living room in order to differentiate with other common designs. 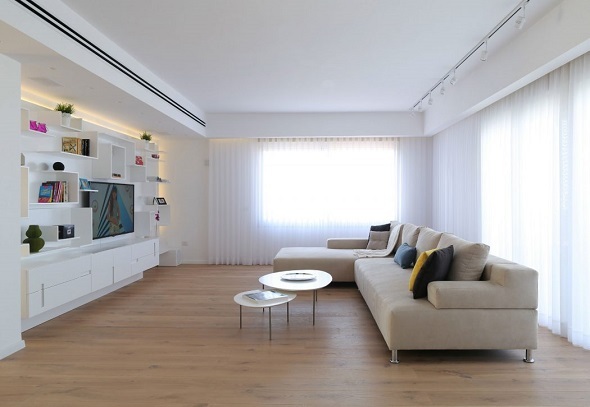 Therefore, Dori Interior Design is carefully choosing a suitable interior for a small living room. Yet, first of all, take a look what the basic color of the living room is. 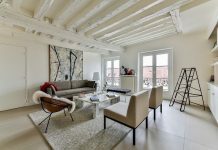 The designer carries a bright white color to make the room wider and cleaner. The color is being supported by the natural sunlight through the windows which is decorated with a white curtain. The reflection of the light through the curtain makes the living room softer and cozier. To place a simple interior is the main aim of Dori Interior Design. The designer places a big multifunctional cabinet in the middle of the living room. This multifunctional cabinet helps you to minimize the living room. So, you do not need place any cabinets in the living room. This big cabinet is used for placing TV, your favorite books, and ornaments. 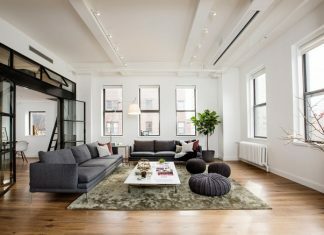 The designer also chooses a simple couch and two minimalist coffee tables as the set. This innovative design has inspired you a lot, right? Here the second design of 3 minimalist small living room ideas which will inspire as well. Lucas y Hernández-Gil Arquitectos as the interior designer decorates a modest living room with a natural circulation in order to produce cozier and livable atmosphere. Firstly, the designer utilizes three open windows which link it to the balcony in order to facilitate the natural air gets into the living room. Besides that, the use of natural sunlight in this living room to minimize your electricity as well. 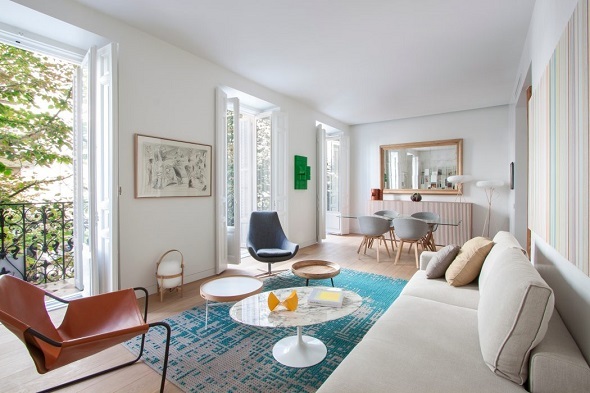 Lucas y Hernández-Gil Arquitectos applies a contemporary interior for small living room as well. This is because of the concept is suitable for the living room. You can see the interior is being arranged perfectly and beautifully. You can use a creative and colorful wallpaper to make your living room more stylish and fashionable. Do you wanna place a display cabinet? Do not worry, you can place it but the first thing you should get is the position firstly. This is one of modern living room designs which are created by Geometrium. 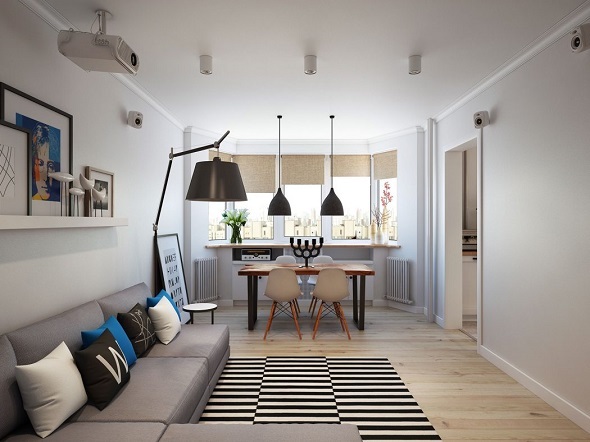 The designer carries Scandinavian style for this small living room as the main concept. 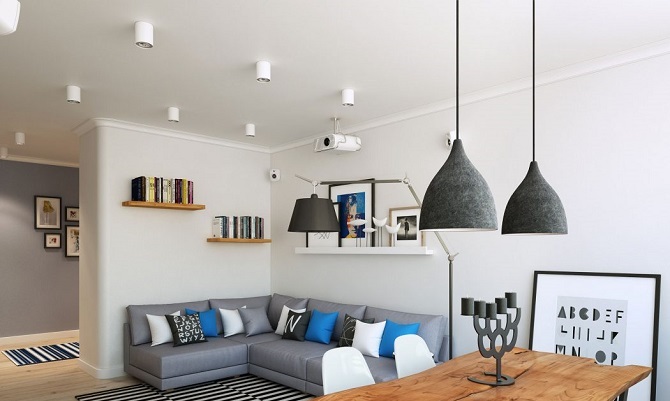 Scandinavian style has creative and minimalist ideas that suitable for a modest living room. The Scandinavian style itself can be spotted from the interior such as a gray couch and a monochrome rug. Scandinavian style is dominated with classic ornaments, so you can place it on the shelf or on the floor. Besides that, the designer also hangs up some Scandinavian chandeliers style in the living room. 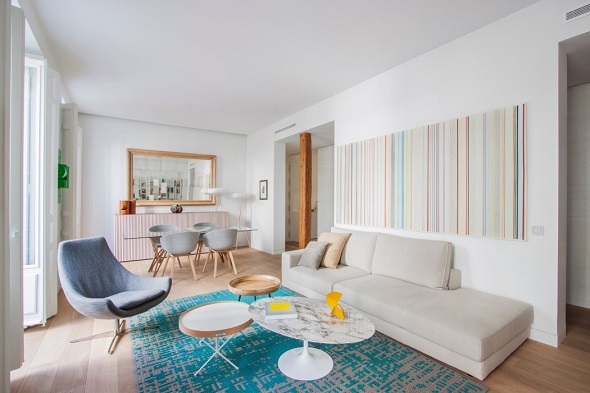 Which one design out of 3 minimalist small living room ideas above that inspire you a lot? Each design is amazing and brilliant. If you want to see other designs, just visit and check here. Have a nice day! Why should you prefer Eco-Friendly Cleaning Products over Chemical Cleaning Products?